The subject of well-preserved soft tissues in dinosaurs is fascinating (and also infuriating for dust-to-diplodocus evolutionists). Reports of these discoveries in other critters are also noteworthy. Evolutionists have to work from deep time presuppositions, so they are flustered by discoveries that do not fit their worldview. One "impossible" fossil discovery is of an arthropod where bits of neural tissue were preserved. Stormie Waters told me that there is considerable consternation up at the Darwin Ranch about another fossil find: a bird. Whether or not scientists are using fossil loosely, to mean permineralized or if the tissues themselves were intact. Either way, soft tissues are delicate things, and a true bird with avian lungs in the "dinosaur age" exists. The feathers were looking mighty good, too. This further refutes the dinosaur-to-bird evolution concept. Both dinosaurs and birds were created recently, evolution is not a factor. Yippie ky yay, secularists! 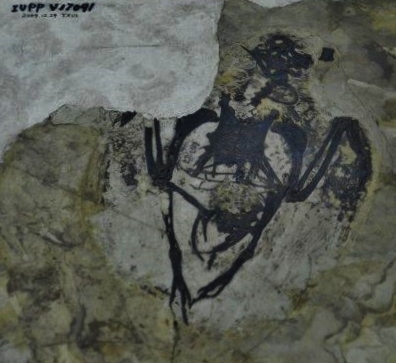 To read the rest, click on "Soft Lung Tissue Found in Modern-Looking Bird from Dinosaur Era". Here is a similar article, "Fossilized Bird Lung Inflates Confidence in Creation".